In economics, a public good is a good that is both non-excludable and non-rivalrous in that individuals cannot be effectively excluded from use and where use by one individual does not reduce availability to others. Gravelle and Rees: "The defining characteristic of a public good is that consumption of it by one individual does not actually or potentially reduce the amount available to be consumed by another individual." In a non-economic sense, the term is often used to describe something that is useful for the public generally, such as education and infrastructure, although these are not "public goods" in the economic sense. This is in contrast to a common good which is non-excludable but is rivalrous to a certain degree. Public goods include fresh air, knowledge, official statistics, national security, common language(s), flood control systems, lighthouses, and street lighting. Public goods that are available everywhere are sometimes referred to as global public goods. There is an important conceptual difference between the sense of 'a' public good, or public 'goods' in economics, and the more generalized idea of 'the public good' (or common good, or public interest),"‘the’ public good is a shorthand signal for shared benefit at a societal level [this] (philosophical/political) sense should not be reduced to the established specific (economic) sense of ‘a’ public good." Many public goods may at times be subject to excessive use resulting in negative externalities affecting all users; for example air pollution and traffic congestion. Public goods problems are often closely related to the "free-rider" problem, in which people not paying for the good may continue to access it. Thus, the good may be under-produced, overused or degraded. Public goods may also become subject to restrictions on access and may then be considered to be club goods or private goods; exclusion mechanisms include copyright, patents, congestion pricing, and pay television. This is the property that has become known as non-rivalry. In addition a pure public good exhibits a second property called non-excludability: that is, it is impossible to exclude any individuals from consuming the good. The opposite of a public good is a private good, which does not possess these properties. A loaf of bread, for example, is a private good; its owner can exclude others from using it, and once it has been consumed, it cannot be used again. A good that is rivalrous but non-excludable is sometimes called a common-pool resource. Such goods raise similar issues to public goods: the mirror to the public goods problem for this case is sometimes called the "tragedy of the commons". For example, it is so difficult to enforce restrictions on deep sea fishing that the world's fish stocks can be seen as a non-excludable resource, but one which is finite and diminishing. V. Ostrom and E. Ostrom proposed additional modifcations to the classifcation of goods to identify fundamental differences that affect the incentives facing individuals (1) Replacing the term “rivalry of consumption” with “subtractability of use.” (2) Conceptualizing subtractability of use and excludability to vary from low to high rather than characterizing them as either present or absent. (3) Overtly adding a very important fourth type of good—common-pool resources—that shares the attribute of subtractability with private goods and diffculty of exclusion with public goods. Forests, water systems, fsheries, and the global atmosphere are all common-pool resources of immense importance for the survival of humans on this earth. (4) Changing the name of a “club” good to a “toll” good since many goods that share these characteristics are provided by small scale public as well as private associations. The definition of non-excludability states that it is impossible to exclude individuals from consumption. Technology now allows radio or TV broadcasts to be encrypted such that persons without a special decoder are excluded from the broadcast. Many forms of information goods have characteristics of public goods. For example, a poem can be read by many people without reducing the consumption of that good by others; in this sense, it is non-rivalrous. Similarly, the information in most patents can be used by any party without reducing consumption of that good by others. Official statistics provide a clear example of information goods that are public goods, since they are created to be non-excludable. Creative works may be excludable in some circumstances, however: the individual who wrote the poem may decline to share it with others by not publishing it. Copyrights and patents both encourage the creation of such non-rival goods by providing temporary monopolies, or, in the terminology of public goods, providing a legal mechanism to enforce excludability for a limited period of time. For public goods, the "lost revenue" of the producer of the good is not part of the definition: a public good is a good whose consumption does not reduce any other's consumption of that good. when professional economists talk about public goods they do not mean that there are a general category of goods that share the same economic characteristics, manifest the same dysfunctions, and that may thus benefit from pretty similar corrective solutions...there is merely an infinite series of particular problems (some of overproduction, some of underproduction, and so on), each with a particular solution that cannot be deduced from the theory, but that instead would depend on local empirical factors. Common confusion is that public goods are goods provided by the public sector. Although it is often the case that government is involved in producing public goods, this is not necessarily the case. Public goods may be naturally available. They may be produced by private individuals and firms, by non-state collective action, or they may not be produced at all. The theoretical concept of public goods does not distinguish with regard to the geographical region in which a good may be produced or consumed. However, some theorists such as Inge Kaul use the term "global public good" for public goods which is non-rival and non-excludable throughout the whole world, as opposed to a public good which exists in just one national area. Knowledge has been held to be an example of a global public good, but also as a commons, the knowledge commons. Graphically, non-rivalry means that if each of several individuals has a demand curve for a public good, then the individual demand curves are summed vertically to get the aggregate demand curve for the public good. This is in contrast to the procedure for deriving the aggregate demand for a private good, where individual demands are summed horizontally. Social goods are defined as public goods that could be delivered as private goods, but are usually delivered by the government for various reasons, including social policy, and funded via public funds like taxes. 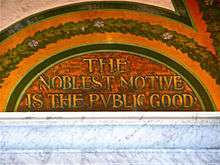 Note that some writers have used the term "public good" to refer only to non-excludable "pure public goods" and refer to excludable public goods as "club goods". Common examples of public goods include: defence, public fireworks, lighthouses, clean air and other environmental goods, and information goods, such as official statistics, software development, authorship, and invention. Some goods, like orphan drugs, require special governmental incentives to be produced, but can't be classified as public goods since they don't fulfill the above requirements (non-excludable and non-rivalrous.) Law enforcement, streets, libraries, museums, and education are commonly misclassified as public goods, but they are technically classified in economic terms as quasi-public goods because excludability is possible, but they do still fit some of the characteristics of public goods. The provision of a lighthouse is a standard example of a public good, since it is difficult to exclude ships from using its services. No ship's use detracts from that of others, but since most of the benefit of a lighthouse accrues to ships using particular ports, lighthouse maintenance can be profitably bundled with port fees (Ronald Coase, The Lighthouse in Economics 1974). This has been sufficient to fund actual lighthouses. Technological progress can create new public goods. The most simple examples are street lights, which are relatively recent inventions (by historical standards). One person's enjoyment of them does not detract from other persons' enjoyment, and it currently would be prohibitively expensive to charge individuals separately for the amount of light they presumably use. Official statistics are another example. The government's ability to collect, process and provide high-quality information to guide decision-making at all levels has been strongly advanced by technological progress. On the other hand, a public good's status may change over time. Technological progress can significantly impact excludability of traditional public goods: encryption allows broadcasters to sell individual access to their programming. The costs for electronic road pricing have fallen dramatically, paving the way for detailed billing based on actual use. Some question as to whether defense is a public good. Murray Rothbard argues, "'national defense' is surely not an absolute good with only one unit of supply. It consists of specific resources committed in certain definite and concrete ways—and these resources are necessarily scarce. A ring of defense bases around New York, for example, cuts down the amount possibly available around San Francisco." Jeffrey Rogers Hummel and Don Lavoie note, "Americans in Alaska and Hawaii could very easily be excluded from the U.S. government's defense perimeter, and doing so might enhance the military value of at least conventional U.S. forces to Americans in the other forty-eight states. But, in general, an additional ICBM in the U.S. arsenal can simultaneously protect everyone within the country without diminishing its services". Public goods are not restricted to human beings. Indeed, it is one aspect of the study of cooperation in biology. Public goods provide a very important example of market failure, in which market-like behavior of individual gain-seeking does not produce efficient results. The production of public goods results in positive externalities which are not remunerated. If private organizations do not reap all the benefits of a public good which they have produced, their incentives to produce it voluntarily might be insufficient. Consumers can take advantage of public goods without contributing sufficiently to their creation. This is called the free rider problem, or occasionally, the "easy rider problem" (because consumers' contributions will be small but non-zero). If too many consumers decide to "free-ride", private costs exceed private benefits and the incentive to provide the good or service through the market disappears. The market thus fails to provide a good or service for which there is a need. The free rider problem depends on a conception of the human being as homo economicus: purely rational and also purely selfish—extremely individualistic, considering only those benefits and costs that directly affect him or her. Public goods give such a person an incentive to be a free rider. For example, consider national defense, a standard example of a pure public good. Suppose homo economicus thinks about exerting some extra effort to defend the nation. The benefits to the individual of this effort would be very low, since the benefits would be distributed among all of the millions of other people in the country. There is also a very high possibility that he or she could get injured or killed during the course of his or her military service. On the other hand, the free rider knows that he or she cannot be excluded from the benefits of national defense, regardless of whether he or she contributes to it. There is also no way that these benefits can be split up and distributed as individual parcels to people. The free rider would not voluntarily exert any extra effort, unless there is some inherent pleasure or material reward for doing so (for example, money paid by the government, as with an all-volunteer army or mercenaries). The free-riding problem is even more complicated than it was thought to be until recently. Any time non-excludability results in failure to pay the true marginal value (often called the "demand revelation problem"), it will also result in failure to generate proper income levels, since households will not give up valuable leisure if they cannot individually increment a good. This implies that, for public goods without strong special interest support, under-provision is likely since benefit-cost analyses are being conducted at the wrong income levels, and all of the ungenerated income would have been spent on the public good, apart from general equilibrium considerations. In the case of information goods, an inventor of a new product may benefit all of society, but hardly anyone is willing to pay for the invention if they can benefit from it for free. In the case of an information good, however, because of its characteristics of non-excludability and also because of almost zero reproduction costs, commoditization is difficult and not always efficient even from a neoclassical economic point of view. An assurance contract is a contract in which participants make a binding pledge to contribute to building a public good, contingent on a quorum of a predetermined size being reached. Otherwise the good is not provided and any monetary contributions are refunded. A Coasian solution, named for the economist Ronald Coase, proposes that potential beneficiaries of a public good can negotiate to pool their resources and create it, based on each party's self-interested willingness to pay. His treatise, "The Problem of Social Cost" (1960), argued that if the transaction costs between potential beneficiaries of a public good are low—that it is easy for potential beneficiaries to find each other and organize a pooling their resources based upon the good's value to each of them—that public goods could be produced without government action. [...] I examined what would happen in a world in which transaction costs were assumed to be zero. My aim in doing so was not to describe what life would be like in such a world but to provide a simple setting in which to develop the analysis and, what was even more important, to make clear the fundamental role which transaction costs do, and should, play in the fashioning of the institutions which make up the economic system. Thus, while Coase himself appears to have considered the "Coase theorem" and Coasian solutions as simplified constructs to ultimately consider the real 20th-century world of governments and laws and corporations, these concepts have become attached to a world where transaction costs were much lower, and government intervention would unquestionably be less necessary. Is there room in the 21st century for something closer to this ideal? A minor alternative, especially for information goods, is for the producer to refuse to release a good to the public until payment to cover costs is met. Author Stephen King, for instance, authored chapters of a new novel downloadable for free on his website while stating that he would not release subsequent chapters unless a certain amount of money was raised. Sometimes dubbed holding for ransom, this method of public goods production is a modern application of the street performer protocol for public goods production. Unlike assurance contracts, its success relies largely on social norms to ensure (to some extent) that the threshold is reached and partial contributions are not wasted. One of the purest Coasian solutions today is the new phenomenon of Internet crowdfunding. Here rules are enforced by computer algorithms and legal contracts as well as social pressure. For example, on the Kickstarter site, each funder authorizes a credit card purchase to buy a new product or receive other promised benefits, but no money changes hands until the funding goal is met. Because automation and the Internet so reduce the transaction costs for pooling resources, project goals of only a few hundred dollars are frequently crowdfunded, far below the costs of soliciting traditional investors. Other crowdfunded projects have raised over a million dollars, like the Arkyd-100 space satellite telescope funded on Kickstarter in June 2013. It would seem to be a clear instance of a Coase solution when a public good that always required government sponsorship in the 20th century can be efficiently organized from 18,000 individuals' self-interest (including rewards such as an orbital "selfie", and five minutes of observation time donated in their name to find potential killer asteroids). If voluntary provision of public goods will not work, then the obvious solution is making their provision involuntary. This saves each of us from our own tendency to be a free rider, while also assuring us that no one else will be allowed to free ride. One frequently proposed solution to the problem is for governments or states to impose taxation to fund the production of public goods. This does not actually solve the theoretical problem because good government is itself a public good. Thus it is difficult to ensure the government has an incentive to provide the optimum amount even if it were possible for the government to determine precisely what amount would be optimum. These issues are studied by public choice theory and public finance. Sometimes the government provides public goods using "unfunded mandates". An example is the requirement that every car be fit with a catalytic converter. This may be executed in the private sector, but the end result is predetermined by the state: the individually involuntary provision of the public good clean air. Unfunded mandates have also been imposed by the U.S. federal government on the state and local governments, as with the Americans with Disabilities Act, for example. Regardless the role of the government is provide vital goods to all individuals, some of which they cannot obtain on themselves. In order to ensure that government services are properly funded taxes and other government controlled entities are enforced. Although enforced taxes deter the free-rider problem many contend that some goods should be excluded and made into private goods. However, this not possible with all goods such as pure public goods that are inseparable and inclusive, thus require "provision by public means". In short, the government has a responsibility to ensure that the social welfare of individuals is met as opposed to privatized goods. A government may subsidize production of a public good in the private sector. Unlike government provision, subsidies may result in some form of a competitive market. The potential for cronyism (for example, an alliance between political insiders and the businesses receiving subsidies) can be limited with secret bidding for the subsidies or application of the subsidies following clear general principles. Depending on the nature of a public good and a related subsidy, principal–agent problems can arise between the citizens and the government or between the government and the subsidized producers; this effect and counter-measures taken to address it can diminish the benefits of the subsidy. Subsidies can also be used in areas with a potential for non-individualism: For instance, a state may subsidize devices to reduce air pollution and appeal to citizens to cover the remaining costs. Similarly, a joint-product model analyzes the collaborative effect of joining a private good to a public good. For example, a tax deduction (private good) can be tied to a donation to a charity (public good). It can be shown that the provision of the public good increases when tied to the private good, as long as the private good is provided by a monopoly (otherwise the private good would be provided by competitors without the link to the public good). The study of collective action shows that public goods are still produced when one individual benefits more from the public good than it costs him to produce it; examples include benefits from individual use, intrinsic motivation to produce, and business models based on selling complement goods. A group that contains such individuals is called a privileged group. A historical example could be a downtown entrepreneur who erects a street light in front of his shop to attract customers; even though there are positive external benefits to neighboring nonpaying businesses, the added customers to the paying shop provide enough revenue to cover the costs of the street light. The existence of privileged groups may not be a complete solution to the free rider problem, however, as underproduction of the public good may still result. The street light builder, for instance, would not consider the added benefit to neighboring businesses when determining whether to erect his street light, making it possible that the street light isn't built when the cost of building is too high for the single entrepreneur even when the total benefit to all the businesses combined exceeds the cost. An example of the privileged group solution could be the Linux community, assuming that users derive more benefit from contributing than it costs them to do it. For more discussion on this topic see also Coase's Penguin. Another example is those musicians and writers who create music and writings for their own personal enjoyment, and publish because they enjoy having an audience. Financial incentives are not necessary to ensure the creation of these public goods. Whether this creates the correct production level of writings and music is an open question. Another method of overcoming the free rider problem is to simply eliminate the profit incentive for free riding by buying out all the potential free riders. A property developer that owned an entire city street, for instance, would not need to worry about free riders when erecting street lights since he owns every business that could benefit from the street light without paying. Implicitly, then, the property developer would erect street lights until the marginal social benefit met the marginal social cost. In this case, they are equivalent to the private marginal benefits and costs. While the purchase of all potential free riders may solve the problem of underproduction due to free riders in smaller markets, it may simultaneously introduce the problem of underproduction due to monopoly. Additionally, some markets are simply too large to make a buyout of all beneficiaries feasible – this is particularly visible with public goods that affect everyone in a country. Another solution, which has evolved for information goods, is to introduce exclusion mechanisms which turn public goods into club goods. One well-known example is copyright and patent laws. These laws, which in the 20th century came to be called intellectual property laws, attempt to remove the natural non-excludability by prohibiting reproduction of the good. Although they can address the free rider problem, the downside of these laws is that they imply private monopoly power and thus are not Pareto-optimal. For example, in the United States, the patent rights given to pharmaceutical companies encourage them to charge high prices (above marginal cost) and to advertise to convince patients to persuade their doctors to prescribe the drugs . Likewise, copyright provides an incentive for a publisher to act like The Dog in the Manger, taking older works out of print so as not to cannibalize revenue from the publisher's own new works. The laws also end up encouraging patent and copyright owners to sue even mild imitators in court and to lobby for the extension of the term of the exclusive rights in a form of rent seeking. These problems with the club-good mechanism arise because the underlying marginal cost of giving the good to more people is low or zero, but, because of the limits of price discrimination those who are unwilling or unable to pay a profit-maximizing price do not gain access to the good. If the costs of the exclusion mechanism are not higher than the gain from the collaboration, club goods can emerge naturally. James M. Buchanan showed in his seminal paper that clubs can be an efficient alternative to government interventions. On the other hand, the inefficiencies and inequities of club goods exclusions sometimes cause potentially excludable club goods to be treated as public goods, and their production financed by some other mechanism. Examples of such "natural" club goods include natural monopolies with very high fixed costs, private golf courses, cinemas, cable television and social clubs. This explains why many such goods are often provided or subsidized by governments, co-operatives or volunteer associations, rather than being left to be supplied by profit-minded entrepreneurs. These goods are often known as social goods. Joseph Schumpeter claimed that the "excess profits", or profits over normal profit, generated by the copyright or patent monopoly will attract competitors that will make technological innovations and thereby end the monopoly. This is a continual process referred to as "Schumpeterian creative destruction", and its applicability to different types of public goods is a source of some controversy. The supporters of the theory point to the case of Microsoft, for example, which has been increasing its prices (or lowering its products' quality), predicting that these practices will make increased market shares for Linux and Apple largely inevitable. A nation can be seen as a club whose members are its citizens. Government would then be the manager of this club. This is further studied in the Theory of the State. If enough people do not think like free-riders, the private and voluntary provision of public goods may be successful. For example, a free rider might come to a public park to enjoy its beauty; yet discard litter that makes it less enjoyable for others. More public-spirited individuals don't do this (they might even pick up existing litter) -- why? There could be several reasons. Perhaps they have lived nearby for years and derive pleasure from helping their community, or at least would feel ashamed if their neighbors or friends saw them. Perhaps they are emotionally attached to the environment, or the park is a national treasure; littering it would offend their patriotism. To the extend that most people behave like this (for any reason), a public good is produced: everyone enjoys a clean park, without the government needing to spend tax money on maintenance crews. Good or bad social behavior is contagious: people unconsciously adapt their behavior to that of their peers. Even people who engaged in free-riding by littering elsewhere are less likely to if they see others hold on to their trash. Social norms can also be observed everywhere people interact, not only in physical spaces but in virtual communities on the Internet. Lawrence Lessig describes how social norms can regulate behavior in cyberspace: through an individual's perceptions from the (physical or virtual) surrounding community. For example, if a disabled person boards a crowded bus, everyone expects that some able-bodied person will volunteer their seat. The same social norm, although executed in a different environment, can also be applied to the Internet. If a user enters a discussion in a chat room and continues to use ALL CAPITAL LETTERS or make personal attacks ("flames") when addressing other users, the culprit may realize s/he has been blocked by other participants. As in real life, users learning to adapt to the social norms of cyberspace communities provide a public good—here, not suffering disruptive online behavior—for all the participants. Experimental literature suggests that free riding can be overcome without any state intervention. Peer-to-peer punishment, that is, members sanction those members that do not contribute to the public good at a cost, is sufficient to establish and maintain cooperation. Such punishment is often considered altruistic, because it comes at a cost to the punisher, however, the exact nature remains to be explored. Whether costly punishment can explain cooperation is disputed. Recent research finds that costly punishment is less effective in real world environments. For example, punishment works relatively badly under imperfect information, where people cannot observe the behavior of other perfectly. Organizations such as the Red Cross, public radio and television or a volunteer fire department provide public goods to the majority at the expense of a minority who voluntarily participate or contribute funds. Contributions to online collaborative media like Wikipedia and other wiki projects, and free software projects such as Linux are another example of relatively few contributors providing a public good (information) freely to all readers or software users. Proposed explanations for altruistic behavior include biological altruism and reciprocal altruism. For example, voluntary groups such as labor unions and charities often have a federated structure, probably in part because voluntary collaboration emerges more readily in smaller social groups than in large ones (e.g., see Dunbar's number). While both biological and reciprocal altruism are observed in other animals, our species' complex social behaviors take these raw materials much farther. Philanthropy by wealthy individuals—some, such as Andrew Carnegie giving away their entire vast fortunes—have historically provided a multitude of public goods for others. One major impact was the Rockefeller Foundation's development of the "Green Revolution" hybrid grains that probably saved many millions of people from starvation in the 1970s. Christian missionaries, who typically spend large parts of their lives in remote, often dangerous places, have had disproportionate impact compared with their numbers worldwide for centuries. Communist revolutionaries in the 20th century had similar dedication and outsized impacts. International relief organizations such as Doctors Without Borders, Save the Children and Amnesty International have benefited millions, while also occasionally costing workers their lives. For better and for worse, humans can conceive of, and sacrifice for, an almost infinite variety of causes in addition to their biological kin. Reciprocal altruism that leads a vampire bat to regurgitate blood to feed a few others in its colony who fed it on previous nights when it flew back hungry, motivates humans to build lifelong careers in huge multinational corporations and lubricates vast systems of banking and trade and production between hundreds or thousands of actors worldwide. Voluntary altruistic organizations often motivate their members by encouraging deep-seated personal beliefs, whether religious or other (such as social justice or environmentalism) that are taken "on faith" more than proved by rational argument. When individuals resist temptations to free riding (e.g., stealing) because they hold these beliefs (or because they fear the disapproval of others who do), they provide others with public goods that might be difficult or impossible to "produce" by administrative coercion alone. One proposed explanation for the ubiquity of religious belief in human societies is multi-level selection: altruists often lose out within groups, but groups with more altruists win. A group whose members believe a "practical reality" that motivates altruistic behavior may out-compete other groups whose members' perception of "factual reality" causes them to behave selfishly. A classic example is a soldier's willingness to fight for his tribe or country. Another example given in evolutionary biologist David Sloan Wilson's Darwin's Cathedral is the early Christian church under the late Roman Empire; because Roman society was highly individualistic, during frequent epidemics many of the sick died not of the diseases per se but for lack of basic nursing. Christians, who believed in an afterlife, were willing to nurse the sick despite the risks. Although the death rate among the nurses was high, the average Christian had a much better chance of surviving an epidemic than other Romans did, and the community prospered. Religious and non-religious traditions and ideologies (such as nationalism and patriotism) are in full view when a society is in crisis and public goods such as defense are most needed. Wartime leaders invoke their God's protection and claim that their society's most hallowed traditions are at stake. For example, according to President Abraham Lincoln's Gettysburg Address during the American Civil War, the Union was fighting so "that government of the people, by the people, for the people, shall not perish from the earth". Such voluntary, if exaggerated, exhortations complement forcible measures—taxation and conscription—to motivate people to make sacrifices for their cause. The Pareto optimum provision of a public good in a society is at the level where the combined sum of the marginal rate of substitution between private goods and a given public good of all individuals is equal to the marginal rate of transformation. This contrasts to the Pareto optimality condition of private goods, in which each consumers marginal rate of substitution is equal; as is the societies marginal rate of transformation. When should a public good be provided? Take, for example, a community of just two consumers and the government is considering whether or not to build a public park. Arthur is prepared to pay up to $200 for its use, while Julia is willing to pay up to $100. The total value to the two individuals of having the park is $300. If it can be produced for $225, there is a $75 gain on its production since it provides services that the community values at $300 at a cost of only $225. Regardless of the method of providing public goods, the efficient level of such provision is still being subjected to economic analysis. 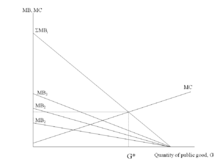 For instance, the Samuelson condition calculates the efficient level of public goods production to be where the ratio of the marginal social cost of public and private goods production equals the ratio of the marginal social benefit of public and private goods production. "If the amount of a public good can be varied continuously, the optimal quantity to produce is that quantity for which the marginal cost of the last unit is just equal to the sum of the prices that all consumers would be willing to pay for that unit." This equilibrium guarantees that the last unit of the public good costs as much to produce as the value that it gives to all of its consumers. An important question regarding public goods is whether they should be owned by the public or the private sector. Economic theorists such as Hart (1995) argue that ownership matters for investment incentives when contracts are incomplete. The incomplete contracting paradigm has been applied to public goods by Besley and Ghatak (2001). They consider the government and a non-governmental organization (NGO) who can both make investments to provide a public good. Who should be the owner of the public good, the government or the NGO? Besley and Ghatak show that the party who has a larger valuation for the public good should be the owner, regardless of whether the government or the NGO has a better investment technology. This result contrasts with the case of private goods studied by Hart (1995), where the party with the better investment technology should be the owner. However, more recently it has been shown that the investment technology matters also in the public-good case when a party is indispensable or when there are bargaining frictions between the government and the NGO. ↑ For current definitions of public goods see any mainstream microeconomics textbook, e.g. : Hal R. Varian, Microeconomic Analysis ISBN 0-393-95735-7; Andreu Mas-Colell, Whinston & Green, Microeconomic Theory ISBN 0-19-507340-1; or Gravelle & Rees, Microeconomics ISBN 0-582-40487-8. ↑ Cowen, Tyler (December 2007). David R. Henderson, ed. The Concise Encyclopedia of Economics. Public Goods. The Library of Economics and Liberty. ↑ Morrell K & Harrington-Buhay N (2012). "What is governance in the public interest? The case of the 1995 property forum in post-conflict Nicaragua". Public Administration (journal). 90 (2): 412–428. doi:10.1111/j.1467-9299.2011.01977.x. ↑ Goodsell, C.T. (1990). Public Administration and the Public Interest’ in G.L. Wamsley and J.F.Wolf (eds), Refounding Public Administration: Modern Paradoxes. Postmodern Challenges. (paperback ed.). Sage. pp. 96–113. ↑ Morrell K (2009). "Governance and the public good". Public Administration (journal). 87 (3): 538–556 (quote is p543). doi:10.1111/j.1467-9299.2009.01756.x. ↑ Samuelson, Paul A. (1954). "The Pure Theory of Public Expenditure". Review of Economics and Statistics. 36 (4): 387–389. doi:10.2307/1925895. JSTOR 1925895. ↑ Elinor, Ostrom (2005). understanding Institutional Diversity. Princeton, NJ: Princeton University Press. ↑ Demsetz, Harold (October 1970). "Full Access The Private Production of Public Goods". Journal of Law and Economics. 13 (2): 293–306. doi:10.1086/466695. JSTOR 229060. ↑ Boyle, James (1996). Shamans, Software, and Spleens: Law and the Construction of the Information Society. Cambridge, Mass. : Harvard University Press. p. 268. ISBN 0-674-80522-4. ↑ Hess, Charlotte; Ostrom, Elinor (2007). Understanding Knowledge as a Commons: From Theory to Practice. Cambridge: Massachusetts Institute of Technology. pp. 12–13. ISBN 978-0-262-08357-7. ↑ James M. Buchanan (February 1965). "An Economic Theory of Clubs". Economica. Blackwell Publishing. 32 (125): 1–14. doi:10.2307/2552442. JSTOR 2552442. ↑ Campbell R. McConnell; Stanley L. Brue; Sean M. Flynn (2011). Economics: Principles, Problems, and Policies (19th ed.). McGraw-Hill/Irwin. p. 104. ISBN 978-0073511443. ↑ Hummel, Jeffrey Rogers & Lavoie, Don. "National Defense and the Public-Goods Problem". ↑ Julou, Thomas; Mora, Thierry; et al. (2013). "Cell–cell contacts confine public goods diffusion inside Pseudomonas aeruginosa clonal microcolonies". Proceedings of the National Academy of Sciences of the United States of America. 110 (31): 12–577–12582. doi:10.1073/pnas.1301428110. PMC 3732961 . PMID 23858453. ↑ West SA, Griffin AS, Gardner A (2007). "Evolutionary explanations for cooperation". Current Biology. 17 (16): R661–R672. doi:10.1016/j.cub.2007.06.004. PMID 17714660. ↑ Ray Powell (June 2008). "10: Private goods, public goods and externalities". AQA AS Economics (paperback ed.). Philip Allan. p. 352. ISBN 978-0-340-94750-0. ↑ Graves, P. E., "A Note on the Valuation of Collective Goods: Overlooked Input Market Free Riding for Non-Individually Incrementable Goods", The B.E. Journal of Economic Analysis & Policy 9.1 (2009). ↑ Babe, Robert (1995). Essay in Information, Public Policy and Political Economy. University of Ottawa: Westview Press. pp. Chapter 3. ↑ Coase, Ronald (October 1960). "The Problem of Social Cost". Journal of Law and Economics. 3: 1–44. doi:10.1086/466560. ↑ Fox, Glenn. "The Real Coase Theorems" (PDF). Cato Journal 27, Fall 2007. Cato Institute, Washington, D.C. Retrieved 17 February 2014. ↑ Coase, Ronald (1988). The Firm, the Market and the Law. Chicago, Illinois USA: University of Chicago Press. p. 13. ↑ Coase, Ronald (1988). The Firm, the Market and the Law. Chicago, Illinois USA: University of Chicago Press. p. 174. ↑ "Kickstarter FAQ". Retrieved 17 February 2014. ↑ "ARKYD: A Space Telescope for Everyone". Retrieved 17 February 2014. ↑ Examples from the entertainment industry include Walt Disney Studios Home Entertainment's "vault" sales practice and its outright refusal to issue Song of the South on home video in most markets. Examples from the computer software industry include Microsoft's decision to pull Windows XP from the market in mid-2008 to drive revenue from the widely criticized Windows Vista operating system. ↑ Elinor Ostrom; James Walker; Roy Gardner (June 1992). "Covenants With and without a Sword: Self-Governance Is Possible". American Political Science Review. 86 (2): 404–417. doi:10.2307/1964229. ↑ Fehr, E., & S. Gächter (2000) "Cooperation and Punishment in Public Goods Experiments", 90 American Economic Review 980. ↑ Fehr, Ernst; Gächter, Simon (2002). "Altruistic punishment in humans". Nature. 415 (6868): 137–140. doi:10.1038/415137a. ↑ Dreber, Anna; et al. (2008). "Winners don't punish". Nature. 452 (7185): 348–351. doi:10.1038/nature06723. ↑ Kristoffel Grechenig, Nicklisch; Thöni, C. (2010). "Punishment despite reasonable doubt—a public goods experiment with sanctions under uncertainty". Journal of Empirical Legal Studies. 7 (4): 847–867. doi:10.1111/j.1740-1461.2010.01197.x. ↑ Brown, C. V.; Jackson, P. M. (1986), "The Economic Analysis of Public Goods", Public Sector Economics, 3rd Edition, Chapter 3, pp.48-79. ↑ Besley, Timothy; Ghatak, Maitreesh (2001). "Government Versus Private Ownership of Public Goods". The Quarterly Journal of Economics. 116 (4): 1343–1372. doi:10.1162/003355301753265598. ISSN 0033-5533. Nicola Acocella (2006), ‘Distributive issues in the provision and use of global public goods’, in: ‘Studi economici’, 88(1): 23-42. Ronald Coase (1974). "The Lighthouse in Economics". Journal of Law and Economics. 17 (2): 357–376. doi:10.1086/466796. Richard Lipsey (2008). "Economics" (11): 281–283. Cowen, Tyler (2008). "Public Goods". In David R. Henderson. Concise Encyclopedia of Economics (2nd ed.). Indianapolis: Library of Economics and Liberty. ISBN 978-0865976658. OCLC 237794267. Requier-Desjardins and Caron Patrick, 2005. Is combating desertification a global public good? Elements of an answer... Les dossiers thématiques du CSFD. Issue 1. 32 pp.